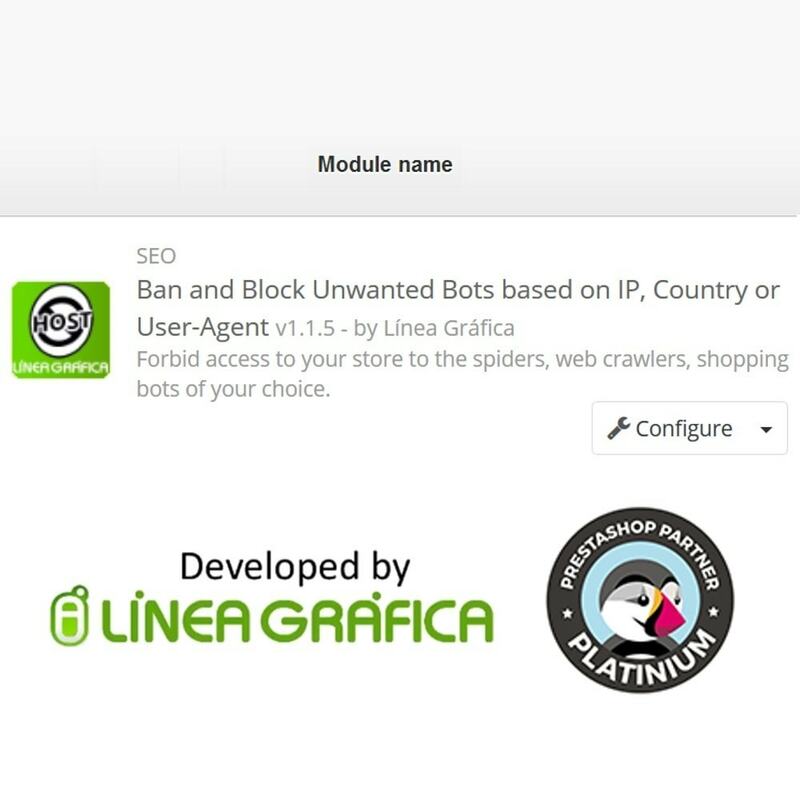 We have designed this module to help you prevent unwanted users from entering your store, especially robots, spiders, crawlers and shopping bots that may cause harm to you store. Write the IP address you want to block and click on "Confirm". After that, the person with this IP will not be able to enter the website and will get a white page with the following message "Forbidden - You don't have permission to access ... on this server". 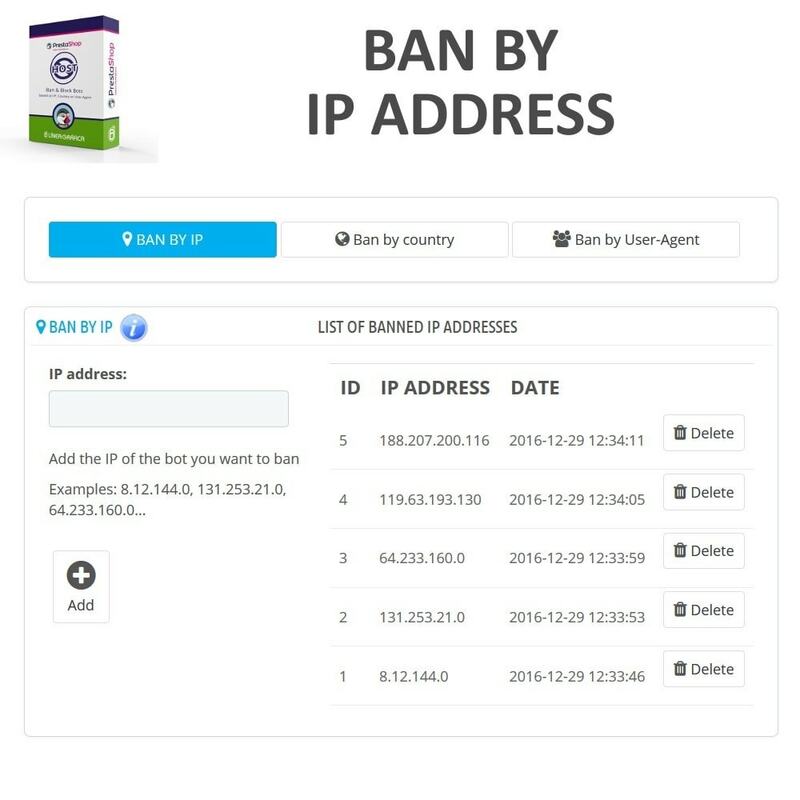 You can create an unlimited number of IP bans. Write the country code you want to block and click on "Confirm". After that, all the persons from this country will not be able to enter the website and will get a white page with the following message "Forbidden - You don't have permission to access ... on this server". 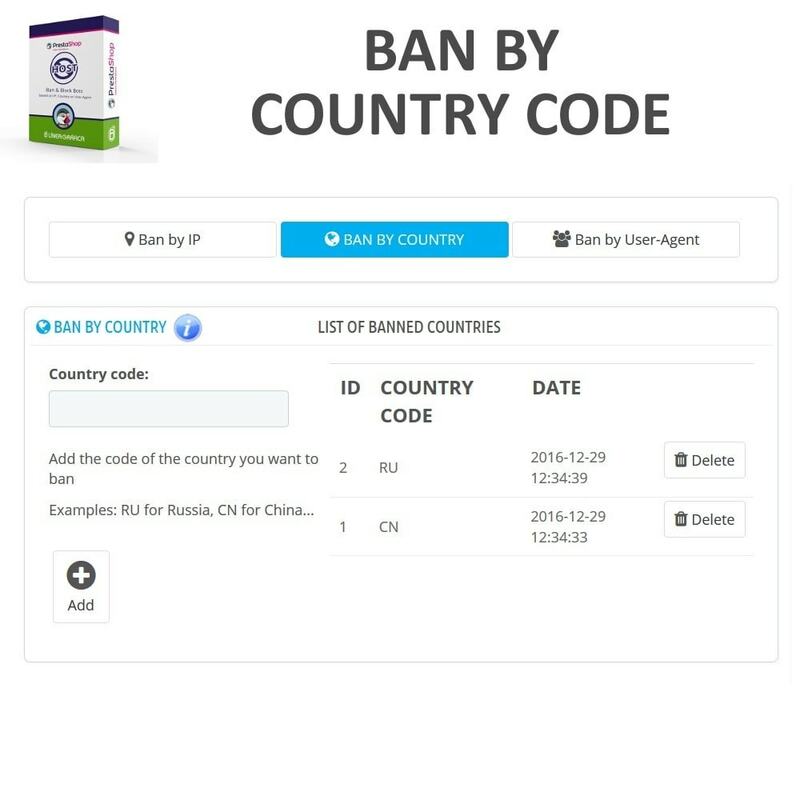 You can create an unlimited number of country bans. Note: you need to have mod_geoip enabled on your server to be able to block users by country (you can ask your hosting to enable it for you). Write the user-agent you want to block and click on "Confirm". After that, this user-agent will not be able to enter the website and will get a white page with the following message "Forbidden - You don't have permission to access ... on this server". 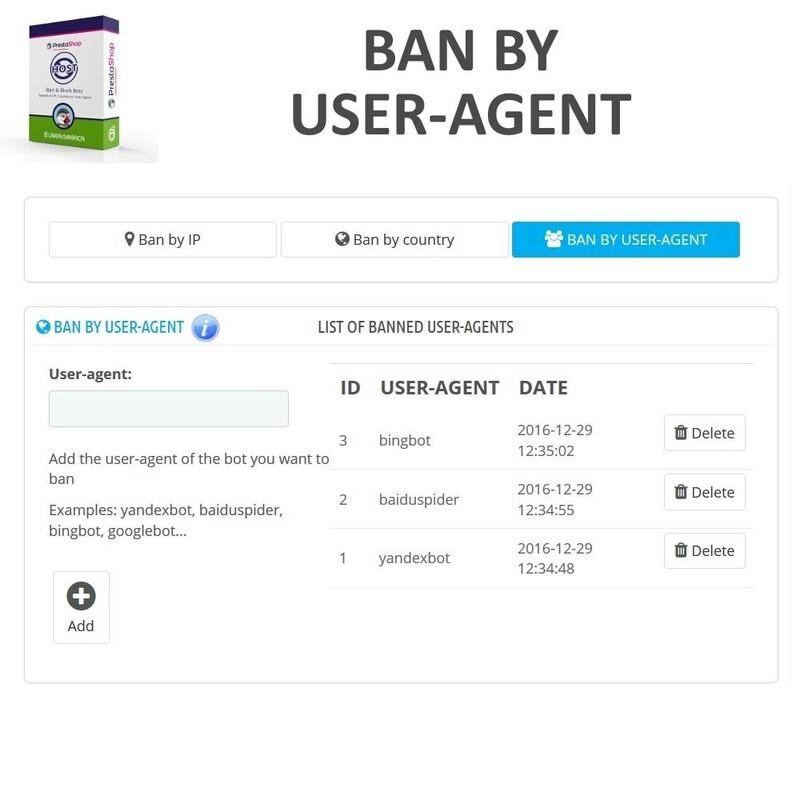 You can create an unlimited number of user-agent bans. IMPORTANT BEFORE BUY THE MODULE: Our module only works with the Apache’s module from GeoIp installed on your system, not with the GeoIp library from PHP. If you don’t have the Apache’s module needed our module will never work in your shop. 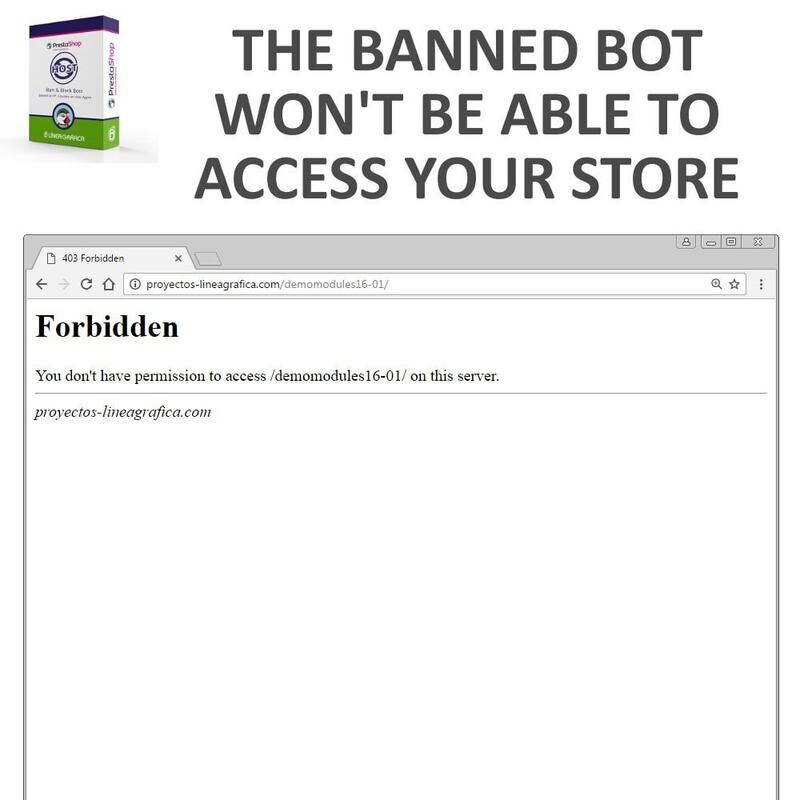 The bans are made in the .htaccess and since this file is common to all shops of the multistore, the bans apply automatically to all shops of the multistore.